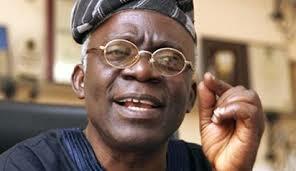 Human rights lawyer, Mr. Femi Falana (SAN), has filed a suit against the Federal Capital Development Authority, seeking N100m damages for the injuries he allegedly sustained when he fell into an uncovered manhole on the street of Abuja. In the suit, marked, CV/0248/17, Falana claimed to have on October 27 fallen into a manhole while walking along the Shehu Shagari Way, Maitama District, Abuja. According to him, the fall left him with a sprain to his right knee when he fell into the uncovered manhole. He was forced to undergo a series of medical procedures, which caused him severe pain as well as physical, psychological and emotional trauma. He said he now had to endure carrying a POP cast about and walking with the aid of crutches for at least four weeks, subject to his doctor’s advice. He said apart from the fact that the accident disrupted his business, he had to pay N209,580 as medical bill at the National Hospital, Abuja where he was rushed to and admitted. Falana is seeking a court declaration that the FCDA failed in its responsibility of either ensuring that the manhole was properly covered up or putting up a caution sign to warn road users. “The defendant ought to know that leaving a manhole open in the middle of the road was dangerous for all road users, especially pedestrians. “The plaintiff avers that the defendant’s negligence caused the accident which led to the severe sprain on his right knee."